The following is an extract from the main article that I wrote for the catalogue of the Cornish Light exhibition, about what the archival material from the exhibition told us about the status of Cornish Art in 1894. 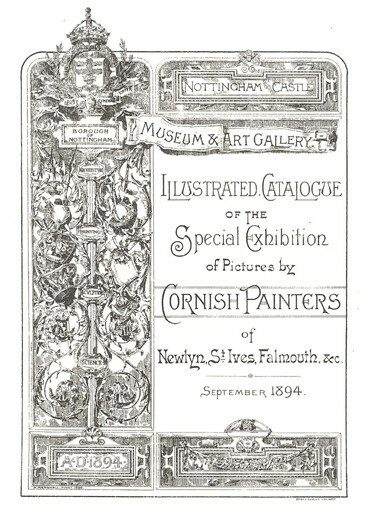 One of the most fascinating features of the archival material relating to the 1894 exhibition retained by Nottingham Castle is the light that it throws on how the Cornish artists were viewed by themselves and others at the time. 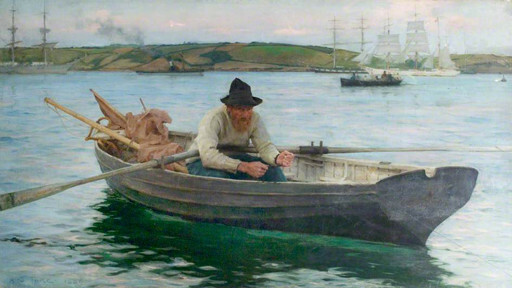 Of particular interest is how the Cornish artists did not want to be viewed, by virtue of their stipulation that, in the pre-publicity for the show and in the catalogue, Harry Wallis should not use the term ‘Newlyn School’ - the description still most often used when referring to Cornish artists. 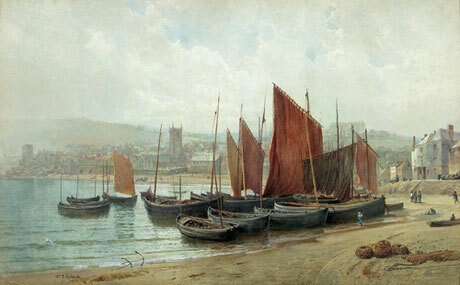 Whilst late nineteenth century Cornish art, particularly that produced in Newlyn, has seen a resurgence of interest in the last few decades, with many visitors from around the country making regular pilgrimages to Penlee House Gallery & Museum, Penzance, to see the exceptional shows that its dedicated staff put on time and time again, it still receives very little exposure outside Cornwall. Accordingly, the exceptionally high regard, in which late Victorian Cornish art was held at the time of the 1894 Nottingham exhibition, will come as a considerable surprise to many. For instance, the show was promoted as containing "many of the principal pictures of the last few years and several that rank with the chief works of the century", whilst the artists themselves were labelled "revolutionaries". In conclusion, it was stated, "It is certain that there never was a more significant body of painters in England than the ’Newlyners’ of today. Individually, there is perhaps greater prominence, but collectively, there unquestionably is not." Accordingly, the exhibition was stated to showcase many of the finest works of the whole nineteenth century by the most significant body of painters in England ever! Albeit the pre-publicity notices, printed in a vast range of papers, vary in length, the similarity of wording used indicates that it was Harry Wallis, who drafted and sent out a standard notice. Naturally, he wanted to arouse interest in the exhibition, but some of the sentiments expressed would appear to result from conversations with the artists about the trials and tribulations that they had faced before they ultimately gained recognition. The Daily Guardian was one of the papers to feature a significant section of Wallis’ draft. "The Cornish School of Painters...have a common ideal, and that ideal is poetry with reality in art, whether it is of the figure or the landscape. Earnestness, insight, unremitting labour, and the most complete abandonment of personal ease, to accomplish the art they adore, have been their watchwords and, so to speak the esoteric signals of their craft...There is no conventionality amongst them, but in an almost invisible manner, figure painters are drawn to Newlyn, while the votaries of the aerial landscape, the conflict between the sea and earth and sky, have found in St Ives their ground of gathering. There is much to be said of the individual work of many, especially of the women whose work is of the highest distinction; and the canvases of Mrs Adrian Stokes, Mrs Stanhope Forbes and others directly challenge the male members of the brotherhood. The Cornish school of painters have had a most difficult and wearisome task. They have had to contend against trickery and falsity, and above all against the dreaded commercial spirit which had entered into English art, and which for many years had ‘boomed’ certain clever but shallow artists as the be-all and end of all British pictorial art. It is to the lasting merit of this school that they have by some dint of genius broken down this ‘corner’ in the world of art. The market can no longer be rigged in favour of a few whose ideas of art lack the vital elements of truth and self-sacrifice. The whole horizon of English art is being changed in the recognition of the work of the Cornish school." The Cornish artists are here being presented as revolutionary geniuses, who have changed the face of British art. Clearly, there is some journalistic licence in these pronouncements, but it is rarely appreciated now that there was a time when Cornish art was considered avant-garde. Further evidence that the Cornish artists had ruffled a few feathers was provided at the Opening Luncheon by the ‘celebrity’ guest speaker, the art critic, Henry Blackburn, whose book on Breton Folk will have been essential reading for many of the Cornish artists, during their earlier trips around Brittany, and who published annual notes on the Academy, New Gallery and Grosvenor Gallery exhibitions. In an unimpressive performance, during which he appears to have committed the cardinal sin of getting some of the Cornish artists’ names wrong, he demonstrated that he was not necessarily a great admirer of the new techniques that the Cornish artists had introduced into British painting. Quoting the viewpoints of other art critics, seemingly with approval, he commented, "They were told by some of the great critics that the Newlyn School if not impressionist, at least took their impressions from nature, and when they felt that they had arrived at a certain point, they stopped, and some people said they did not finish their pictures. At any rate many men were wise enough to say that they very often left off painting where the difficulties began." 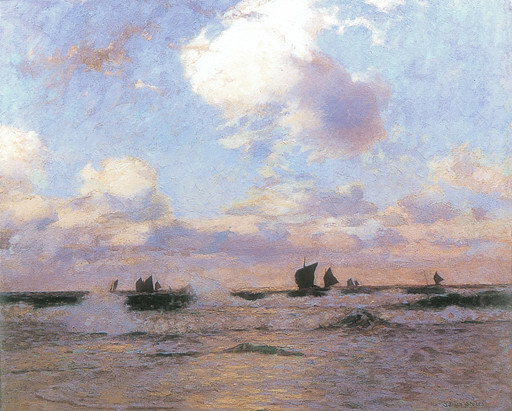 This criticism that the work of the early Cornish artists lacked the requisite high degree of finish required for academic painting was one typically levelled at them in the 1880s, but most art critics had now come to accept that such apparent sketchiness, which left broad brushstrokes visible and outlines fuzzy, was actually the result of the artists’ in-depth observation of the effects of light and atmosphere in nature. The eye did not see the hard outlines considered correct in academic painting. It was for this reason that one of the newspapers also referred to the Cornish artists as ‘the wet cat school’!